Most cinephiles are familiar with the collectible arthouse Mondo and the amazing pieces they sell in very limited supply to only the most rabid fans. Every now and then they have some other goodies too like t-shirts or an entire clothing and accessory line dedicated to The Shining, but now they're getting into the market of action figures, statues and toys. USA Today reports Mondo will kick off this new venture at Comic-Con with a first wave of toys that includes a 16-inch figure of The Iron Giant, a vinyl figure for Teenage Mutant Ninja Turtles and an action figure of iconic director Alfred Hitchcock. More below! The figure has 30 points of articulation and lights up, not to mention having a magnetic "S" from a "Seafood" sign to put on his chest, and an interchangeable dented head and weaponized arm to make the scary battle version of the character. 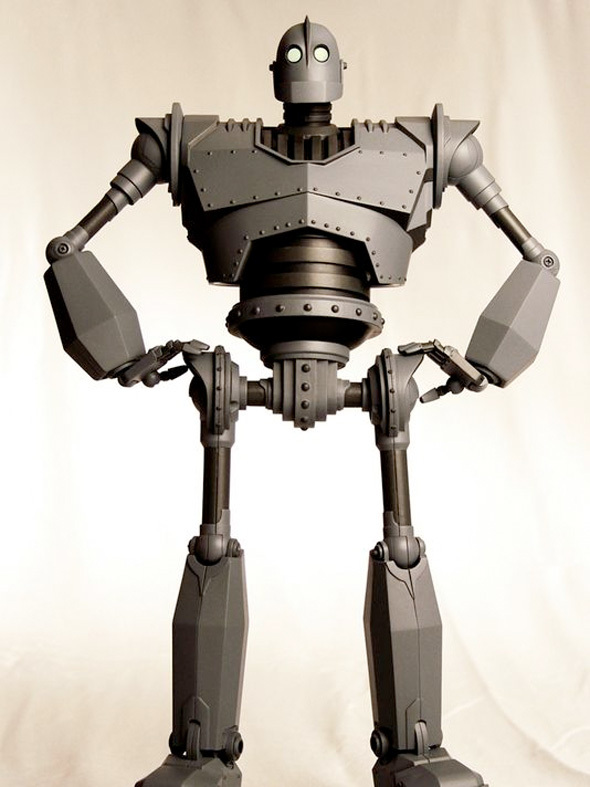 Mondo was helped by the fact that they had animation files from Warner Bros. to authentically re-create Iron Giant. In addition, there's talk of a 6-inch replica of the Iron Giant's bolt, the first piece of the robot discovered by Hogarth in the 1999 film. As for the Teenage Mutant Ninja Turtles figure (check out a small image at USA Today), it's called "Lil' Mikey" and it's based on a piece of work done by one of Mondo's regular artists, Mike Mitchell. The poster was based on TMNT creator Kevin Eastman's first drawing of one of the heroes in a half-shell, and the figure is based on Mitchell's piece which features Michelangelo holding a TMNT popsicle with crooked gumball eyes. Oh, and Alfred Hitchcock's action figure has been approved by his family and comes with cool accessories like a butcher knife, raven and seagull. Thankfully, it sounds like these toys won't be nearly as limited as the prints that fans clamor for pretty much every week. Mondo's Justin Ishmael definitely wants these available to a bigger audience, hoping that these kind of toys can eventually be on store shelves. Ishmael says, "I want to be Todd McFarlane for this generation of toys and get it to where it's not OK to put out crappy toys. If you put out crappy toys, they won't sell because there's all this good stuff next to it." He'll get his chance to show how good these toys are with pre-orders up in August or September with the hope of shipping them out to arrive by Christmas. We can't wait to see what else Mondo has in store down the road on the toy side of things. Very detailed. I dig that they are diversifying. I want it soooooooo much.